Twilight Struggle remained the most popular CDW event at WBC this year. 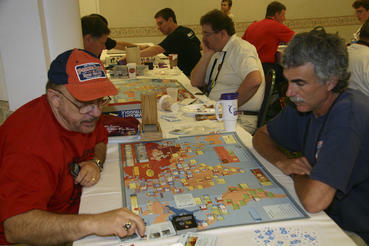 Henry Jones (left), a frequent WBC attendee who has been absent for several years, returned with Twilight Struggle high on his list of must-plays. 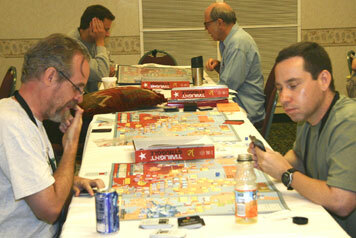 The long twilight struggle continued in 2007 with 66 hopefuls. The first two rounds saw a remarkable lack of dropouts, as winning players pressed on to go as far as they could. In general the quality of play was extremely high, with established players from last year and on Wargameroom.com given all they could handle by players who had been previously unknown to them.. 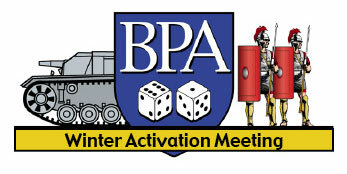 The quarter-finals were a true murderers' row, with four of the eight participants having compiled impressive records in live online play on Wargameroom.com. Of particular note was Rob Hassard's victory over Bruce Wigdor, a game that ended in a draw, and by tournament rule was resolved by a die roll! In that same game, Bruce had exhibited his usual high level of sportsmanship, permitting Rob to take back a move that would have resulted in nuclear war (and a win for Bruce). The reward for Rob's skillful U.S. play was a semi-final match against defending champion Stefan Mecay (who had just defeated George Seary's Soviets in a masterful quarter-final performance). For a long time it appeared Stefan's title defense hopes were dead, as Rob's Americans put together a +18 lead during the Mid War, but Stefan's methodical, never-say-die play style paid off. To his credit, Rob went for the knockout punch over and over again, only to be foiled by the dice or a clever countermove by Stefan, and in the end Stefan was able to battle all the way back for a dramatic comeback victory in Final Scoring. Stefan's Final opponent was Rick Young, whom he had beaten in the 2006 semi-finals. The match was almost anticlimactic, as Rick drew persistently awful cards, and Stefan's dice heated up. Rick had suffered from bad luck throughout the tournament, but his consummate skill allowed him to overcome it until now. Stefan's Soviets took an automatic victory, and the 2007 Twilight Struggle championship, in Turn 5. The 2007 tournament used bidding for influence points, in which players bid for the Soviets and gave additional at-start influence points in the amount of the bid to the U.S. player. The mean bid was 2.08, and this resulted in an overall tournament balance of 31-28 in favor of the USSR. The USSR fared particularly well in Round 2, winning 10 of 15, but the US rallied in most of the other rounds. In general, it appeared that players who bid 3 or more influence points to play the USSR took a great risk in the event if they drew quality opponents. I would like to thank all the players for their participation and sportsmanship during the tournament--in which only one game out of 54 had to be adjudicated--and for their indulgence of a first-time GM's foolhardiness in running a 66-man tournament. Rick Young's service as assistant GM was invaluable, although I am tempted to bad-mouth him so that I can monopolize him for next year. I hope everyone will return in 2008 to try their skill and see if they can unseat Stefan, who proved himself a true master of the game with his succesful defense of the title against such a strong field. In the Final, Monnin finally yielded the Soviet side to Birnbaum at a bid of 4. Turn 1 witnessed Asia Scoring and Turn 2 Mideast Scoring, setting up a deadly re-shuffle for Turn 3 in which Birnbaum put the Red Scare on the Americans and then racked up big VPs with scoring of Asia, Europe, and the Middle East. Birnbaum finally sealed the game in Turn 5 with the SE Asia Scoring Card to earn an auto victory.Here are the final rankings and records of the top players (tourney points are a measure of a player’s wins plus strength of opposition).